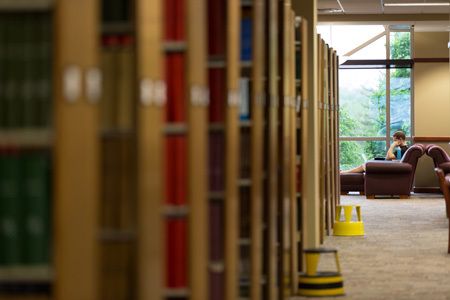 Due to space constraints, the DMU Library is only accepting donations of new and used books published within the last 3-5 years that pertain to the fields of study in Medicine and Allied Health. Rare books, books published in the 17th and 18th centuries, and archival materials relating to the history of the University will also be accepted. Donated items may be added to the Library Collection entirely at the discretion of the staff and in accordance with the Library’s Collection Development policy. Once donated, items will become the property of the Des Moines University Library. Any materials deemed duplicative, or outside the scope of the University Library and Archives’ collection guidelines may be given to other libraries, non-profit agencies, sold, or discarded. Donated items cannot be returned to the donor and the Library will not accept any item that is not deemed a gift. It is the responsibility of the Library staff to determine when to withdraw a gift from the collection. The DMU Library staff will acknowledge the gift of donated items by written letter, but we cannot set market or appraisal values for donations. We would recommend that the donor compile a list of items they seek to donate and independently determine the fair market value or seek the services of an expert in the area in order to establish their value for tax purposes. Monetary gifts and memorial contributions are also welcome. Donated funds will be used to purchase material for the collection in accordance with the DMU Library’s Collection Development policy. Items purchased with gifts or memorial funds will be recognized with special donor bookplates. We are open to suggestions for topics as long as they fall within our collection guidelines. As with any donated materials, the Library staff will reserve the right to withdraw material purchased with donated or memorial funds once it becomes outdated. DMU has a memorial gifts program to benefit the Library. This program allows donors an opportunity to honor the memory of someone close to their heart by making a gift to DMU. If you are interested in the memorial gifts program, contact the Development Office at donations@dmu.edu or 515-271-1387.